The BlackBerry PlayBook is looking increasingly like going the way of the HP TouchPad, with RIM offering the tablet to employees at a huge discount. RIM's latest desperate attempt to shift some of the crippling inventory currently launguishing in warehouses sees the company offer PlayBooks for just $99 to all employees - thats about £62. Through a corporate portal workers can buy up to eight PlayBooks at the discounted rate, which also sees the 32GB device on sale for $149 and the 64GB model for just $199. The deal could be the latest step towards offering those prices to the public in a fire sale reminiscent of HP's ill-fated WebOS tablet, which saw a surge in sales when reduced to under £100. 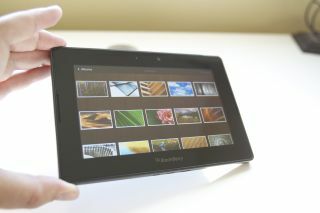 The employee offer is likely to see RIM take a huge hardware loss on the device, while most of the devices will likely end up on sell-on sites like eBay or the Amazon Marketplace. The BlackBerry PlayBook tablet, which started off with an RRP of £399, has endured a disastrous year since it hit the shelves this spring. Plagued by software problems, no native email client and the non-appearance of the promised Android app player, its potential is unlikely to ever be fulfilled. RIM also has to contend with the cut-price Amazon Kindle Fire tablet in the US, which makes a public PlayBook fire sale all the more likely in the coming weeks.